Bell peppers are usually sold green, but they can also be red, purple or yellow. Tomatoes are very high in the carotenoid Lycopene; eating foods with carotenoids can lower your risk of cancer. Most of the nutrients in a potato reside just below the skin layer. A horn worm can eat an entire tomato plant by itself in one day! California produces almost all of the broccoli sold in the United States. White potatoes were first cultivated by local Indians in the Andes Mountains of South America. 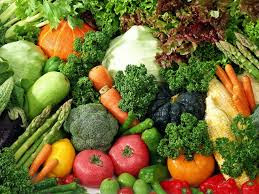 Eating raw vegetables retains more nutrients than heating them. Yams and sweet potatoes are not the same thing! Vegetables start losing their nutrients the moment they are picked, albeit slowly. Once in contact with water or heat, the process is greatly accelerated. A baked potato (with skin) is a good source of dietary fiber (4 grams). Actually a fruit, it took a ruling by the Supreme Court in 1893 to make the tomato a vegetable. Potatoes first appeared in Europe in 1586; they made it to North America in 1719. The potato disease “Late Blight” was the principal cause of the Irish Potato Famine, which killed a half million people. The original carrots used to be purple? Farmers in Holland started planting orange carrots in the sixteenth century. Broccoli and cauliflower are vegetables, but they are also actually flowers. Cucumbers are one of the oldest vegetables, cultivated for thousands of years in India and Asia. Red capsicums contain a higher amount of Vitamin A and C than the green ones. Brinjals, also known as eggplant, are really a fruit. Peas have a high sugar content, so it’s preferable to eat them up quickly. If you eat salty foods, corns help balance the body’s fluids as they are a good source of potassium. 35% of an adult’s daily requirement of Vitamin C can be found in a medium-sized potato. It is recommended that you eat five servings of fruit or vegetables a day. A serving equals one-half cup. According the USDA, we’re supposed to get 5 servings of vegetables a day. That’s about 2 and a half cups worth. Unfortunately, less than one third of Americans meet their daily vegetable requirement.